May 3, 2018, Thekchen Chöling, Dharamsala, HP, India – This morning, under stormy skies, His Holiness the Dalai Lama walked from his residence to the Tsuglagkhang, to take part in a second Dialogue between Russian and Buddhist Scholars – Understanding the World. 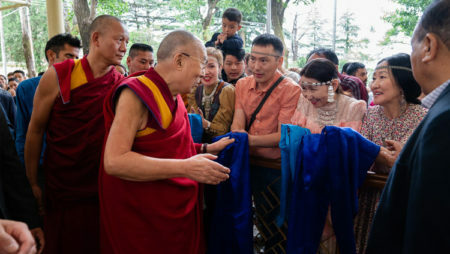 The event was organized by the Center of Tibetan Culture and Information (Moscow), Save Tibet Foundation (Moscow), and the Dalai Lama Trust, with the support of the Center for Consciousness Studies at the Lomonosov Moscow State University and the Institute of Philosophy, Russian Academy of Sciences. In the temple, he paid his respects before the statue of Buddha Shakyamuni and saluted the monks sitting nearby. He then turned to greet old friends among the nine Russian scientists gathered round a table in the main body of the temple. The remaining space was filled by about 150 observers including 75 Russians, 18 Tibetan monks who have experience of studying science, 17 students from the Institute of Buddhist Dialectics, Sarah, 25 from the Men-tsee-khang, 50 students from the Tibetan Children’s Village, three from Tong-len and two teachers from the Dharamsala Government College, in addition to 18 guests of the Ganden Phodrang. 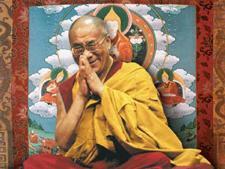 “Brothers and sisters, that’s what I believe we 7 billion human beings are,” His Holiness began. “A lot of the problems we face today are of our own making. And yet scientists say that our basic human nature is essentially compassionate. We create problems because we are under the sway of emotions and because we view other people in terms of ‘us’ and ‘them’. Out of short-sightedness we forget that we are all part of humanity, which leads to our doing others harm. We consider that the destruction of our foes is our victory, and in the past that may have been true. But, today, we are so interdependent that when others are harmed, we’re harmed as well, besides which we have to deal with problems like climate change that affect us all. His Holiness recommended that as human beings we need to assess whether anger has any value—noting that it destroys our peace of mind. Compassion, on the other hand, brings optimism and hope. He remarked that some religious traditions rely on fear to bring about better behaviour. He rejects this because it tends instead to lead to pessimism and discouragement. Prof Alexander Kaplan told His Holiness of the interest his students in Moscow are taking in this meeting. He mentioned his attempts to make direct contact with the brain in work with stroke victims who have lost the ability to speak or move. He described how their choice of letters displayed on a screen can be gleaned from responses in their brains that enable communication to take place. He sees this as having potential for understanding the workings of emotions in otherwise healthy people. His Holiness commented that the innermost subtle consciousness that is described as Buddha-nature has immense potential and people are trying to explore it, but it will take a great deal of time.